Burlington, Vermont – Ash Printzen of Las Vegas and the AAA Detroit Honeybaked girls 19u lost 3-1 to the hometown Burlington Barracuda girls 19u early this morning at the Leddy Park Ice Arena. In game two Ash and the AAA Detroit Honeybaked girls 19u beat the AAA Connecticut Polar Bear girls 2-0. Cody Printzen of Las Vegas is off to the pre-season training camp with the WSHL Fresno Monsters. The Las Vegas Cavalry will rebrand this season as the Vegas Jesters. Same team, Vegas-style name. The Vegas Jesters will host open tryouts at City National Arena on Saturday Sept. 15 at 6 PM and Sunday Sept. 16 at 9 AM and 6 PM. Las Vegas loves its Golden Knights. What’s not to love, right? In a debut season unparalleled by an expansion franchise in major professional sports, the Knights won the Pacific Division and Western Conference championships, and held a 1-0 lead in the Stanley Cup Final before dropping four straight for the first time all season, to long-denied Washington. Little wonder Vegas averaged 18,042 fans per game in an arena that seats only 17,500. Success and fan fervor like that have driven a desire not only for jerseys and the like — the Knights led the NHL in merchandise sales through its official online retailer and goalie Marc-Andre Fleury had the fourth-best-selling player jersey in the league — but also for the brands favored by the players on the ice. William Karlsson led the NHL in plus/minus at plus-49 while scoring 78 points in 82 games. His 43 goals were a record for an expansion team, and he notched the first two hat tricks in team history. He’s one of four Knights to use a Warrior Alpha QX stick (along with Alex Tuch, Deryk Engelland and Jon Merrill), which happens to be the most popular stick in the league. Karlsson mixes it up more, brand-wise, than most, wearing CCM’s Super Tacks gloves and Vector V08 helmet, while going with Bauer’s Nexus 1N skates. The V08 is a classic design and is far and away the league’s most popular model, being worn by 28.7 percent of active-roster players at the end of the 2017-18 season. The Knights are even more devoted to the V08, with a dozen members of their 23-man roster wearing it at season’s end. Along with the V08, center Jon Marchessault hardly shies away from trendy gear choices. Granted, he doesn’t shy away from much. At just 5-foot-9, Marchessault delivered 99 hits during the regular season and was fourth on the team with 40 penalty minutes. Also, the Knights’ second-leading scorer with 75 points in 77 games, Marchessault goes with CCM’s Ribcor Trigger 2 PMT for his stick, wears CCM HG12 gloves and skates on the Bauer Supreme 1S model. The stick is No. 3 on the overall NHL list; the gloves are the most popular among the 13 models in the league from CCM, which leads that particularly crowded equipment segment for market share; while the skates rank No. 2 in the league behind Bauer’s Vapor 1X 2.0. Bauer is on the feet of 67.9 percent of the NHL’s skaters. The Vapor 1X 2.0 and the Supreme 1S, combined, are worn by nearly half the league. The Knights are no exception to the Bauer bonanza, as 13 Vegas players don that company’s skates. Five wear either the 1X 2.0 or its predecessor, the Vapor 1X; four wear the Supreme 1S and the Nexus 1N. TRUE has only one skate model in the league, its Pro Custom, but it is worn by three Knights (Brad Hunt, Erik Haula and William Carrier) and ranks as the league’s third-most-popular overall skate. Nate Schmidt was a seemingly constant defensive presence for the Knights, logging a team-high 22 minutes per game while leading the team with 57 takeaways and blocking 121 shots. Is it any surprise he’s equally steady in his gear choices? He’s a CCM guy across the board using a Ribcor Trigger ASY stick, Quicklite gloves, JetSpeed Skates and the V08 helmet. Warrior doesn’t make skates, but if it did, you’d have to figure Tuch and Engelland would wear them. Every other gear item they use is Warrior. Fleury is a CCM guy across the board (skates, stick, gloves, blocker, pads, mask). League-wide, Bauer puts more sticks, skates and helmets on the ice than any other company — but the Golden Knights favor CCM in every gear segment except skates. Ash Prinzten of Las Vegas had two goals, one assist last weekend for the AAA Detroit Honeybaked girls 19u against Bluewater Hawks of Canada. Ash’s two goals in the first game helped Honeybaked win the first game 5-2. This weekend Ash and the Honeybaked team are playing games at the Leddy Park Ice Arena in Burlington, Vermont. There are two games on Friday – versus the Connecticut Polar Bears and Southern Burlington. It is easy to report weekend game scores and highlights to Vegas Hockey. We are on the hunt for scores involving all Las Vegas players and their teams from all areas of the USA, Canada and those players in international action. 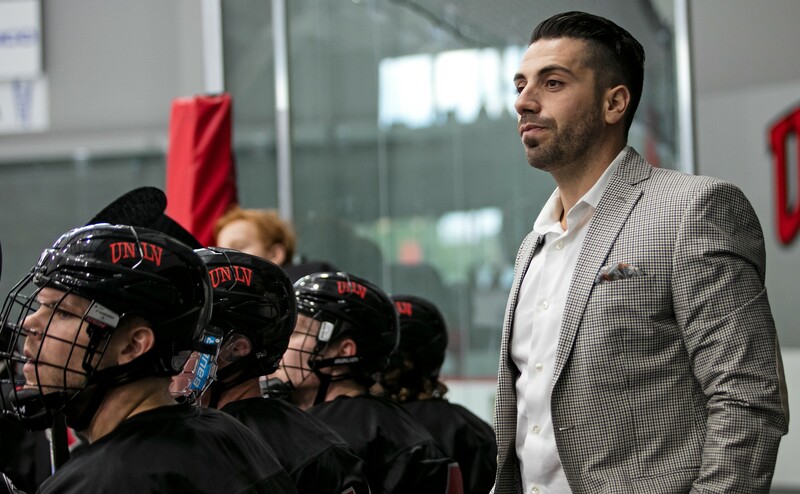 UNLV Rebels head coach Anthony Greener and his Rebels skaters have won ACHA Western Regional Championships and have played in the U.S. Nationals the last two seasons. UNLV will open its hockey season vs a tough rival – the University of Colorado – on Friday, September 14 at City National Arena here in Las Vegas. Here is UNLV from the very beginning when the program was launched in 2005-6 at the Santa Fe Stations Ice Arena on North Rancho Drive. UNLV’s first-ever game was on home ice against UCLA in the fall of 2005.